You can dig, fill and grade right next to buildings, footings and foundations, and in roadways and crowded urban areas thanks to the compact design and zero tail swing of the E17C mini digger (reduced tail swing if you choose the E17C with long arm). You can offset the excavator boom left or right within the operating range to match the situation. Make the most of every minute of your day with the power, performance and versatility of New Holland C Series compact tracked excavators. With a quiet, 16.8-horsepower, Tier 4 Final engine, the E17C excavates, grades and backfills with one machine and save fuel while doing it. The E17C’s variable undercarriage retracts for entry through tight egresses and then extends for stability while working—just another way you can fit into tight spots. 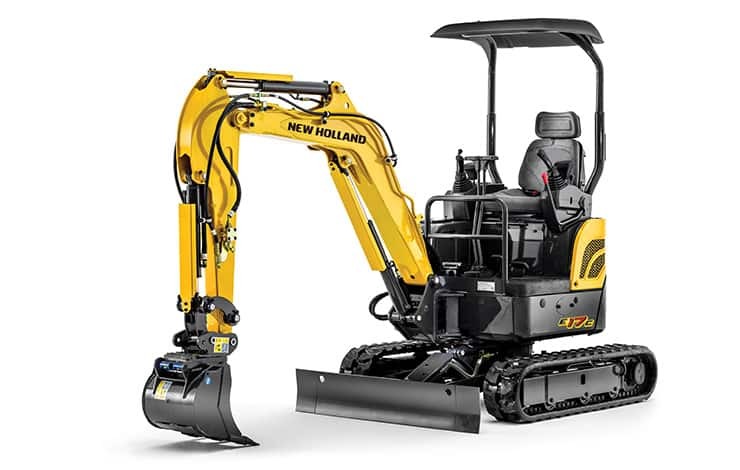 New Holland is the excavator brand to choose. With SAE bucket breakout digging force of 3,490 lbf and dig depth up to 7’3”, the E17C mini ex puts big digging power where you need. You also get top-of-class ground clearance and excellent dozer blade lift height for maneuvering and working in rough conditions. Operator productivity has everything to do with a comfortable work environment. The E17C operator area with 2-post canopy provides excellent all-around visibility, ergonomic controls and adjustable seating.